Product prices and availability are accurate as of 2019-04-25 16:50:31 EDT and are subject to change. Any price and availability information displayed on http://www.amazon.com/ at the time of purchase will apply to the purchase of this product. 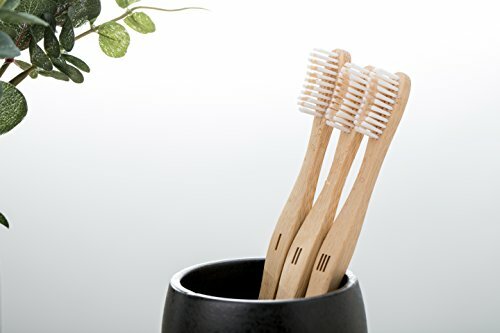 This Bamboo Toothbrush Set is producing and sold only by Zyablyk Company. Buying it from other Sellers will lead to counterfeit products receiving. Zyablyk Company has no responsibility for inauthentic products, purchased from other Sellers. Join The Bamboo Toothbrush Revolution! Do Something Good For Your Teeth & The Environment! ... your old plastic toothbrush. ... all your bulky toothbrushes. ... harsh bristles that would damage your enamel. ... ineffective toothbrushes that don't reach all hard to get areas. Ergonomic Toothbrush On The Hand - Soft On Your Teeth! Our bamboo toothbrush features an ergonomic handle that is easy to maneuver. Forget about splinters and slivers. Our handle is smooth and comfy. The super soft bristles toothbrush is gentle with your teeth. They are made from BPA free Nylon and are meticulously crafted to stay in the handle and not to fall out. The curved shape of the soft bristles toothbrush ensures fine teeth polishing. It helps you clean every last corner of your mouth. Stock up your toothbrush organizer with our wood toothbrushes. Throw all those chemically packed plastic ones. Do your part to protect the planet and teach your kids about good habits regarding their oral hygiene and the environment. · Individually sealed. Numbered as well. · Safe for your teeth, gums and enamel. · Curved and soft bristles. 100% BPA Free. · Travel toothbrush holder for sweat free carrying. May be used as toothbrush orginizer. · Pack of 3. 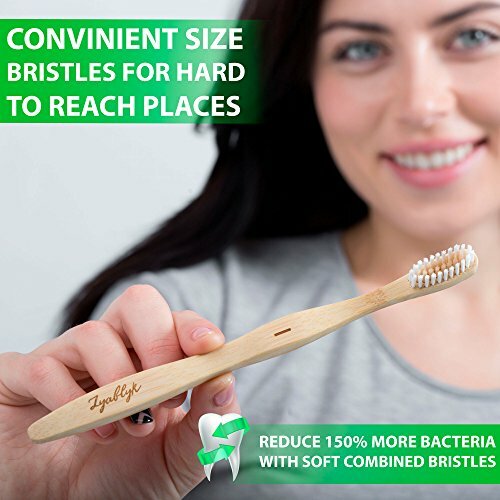 More organic biodegradable toothbrushes for you and your family. EACH BAMBOO TOOTHBRUSH PACK CONSISTS OF: 3 numbered bamboo toothbrushes and a convenient carrying toothbrush case with ventilation openings. Each toothbrush is individually wrapped for hassle free transportation. Perfect for home, traveling, the office and more. Works great with ordinary toothpaste, whitening powder or even charcoal. PROTECT YOUR TEETH & ENAMEL: Using a combination of an ergonomic toothbrush handle and perfectly curved soft bristles, our manual toothbrush will gently cleanse and polish your teeth without ever hurting their enamel. Perfect for men, women, kids, families, older people and those with sensitive teeth or bleeding gums! BE GOOD TO THE PLANET - 100% ORGANIC: If you care about your oral hygiene and environmental prosperity, then this bamboo toothbrush set is the way to go. 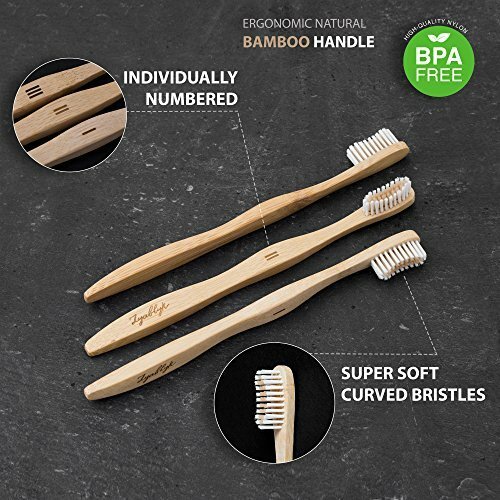 Made of high quality BPA free and soft Nylon bristles and 100% organic biodegradable bamboo our toothbrushes will optimize your oral health and minimize waste. ENHANCE ORAL HYGIENE: Promote better dental hygiene effortlessly with our organic bamboo toothbrush. Rid yourself of harmful mouth bacteria, prevent nasty odors, keep your teeth pearly white and protect their enamel. No need to spend a small fortune on pricey dentist's appointments. Fortify your teeth. We've got you covered. JOIN THE ECO WAY TODAY: Zyablyk Company's mission is to satisfy even your most demanding teeth brushing needs and protect the environment at the same time. 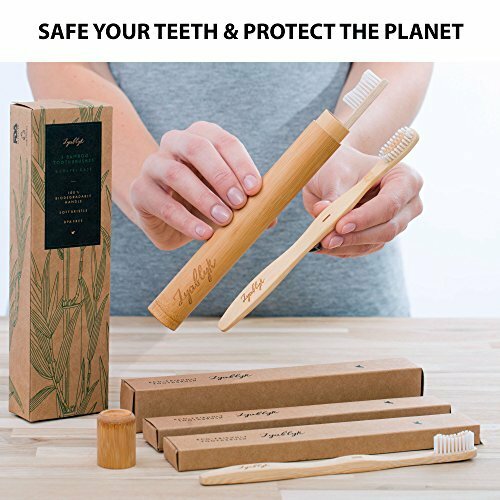 That is why our organic bamboo toothbrushes are designed in such a way so as to help reduce negative impact on our planet and keep the mother Earth safe.